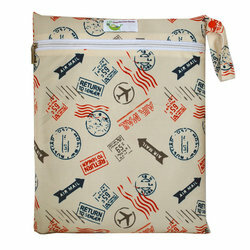 Take Sweet Pea Diaper Wet Bag with you when you are out and about to carry your wet/soiled cloth diapers. Sweet pea wet bags uses don't stop at cloth diapers; use them for dry diapers, to store cloth baby wipes and diaper solutions, tuck wet bathing suits away after a swim, stuff with cosmetics or toiletries when traveling…there are an endless amount of ways to use your wet bags. A pretty standard wet bag. The material dries pretty quickly and is lightweight. 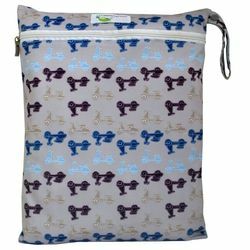 So the diaper days won't last forever so I'm glad I can get wet bags in some of my favorite prints to use! I love the print and the zipper is fancier than I expected! I love the snap on the handle. Great for a day's worth of diapers and I don't mind that it's one layer of pul. This wet bag is adorable! It's easy to pack since it's just one layer of PUL. The zipper is modern and sturdy. 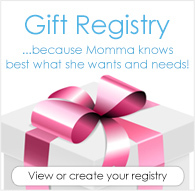 It's one of my favorites for the diaper bag or packing bibs/cup/snacks for going out. It does let on a little smell, but not a big deal when it's inside the diaper bag. These wetbags are a touch smaller than most medium sized wetbags IMO but the perfect size for my two older babies who don't need changed often but when they do, I'm dealing with two diapers at a time. It's a nice in between size and a great quality! I bought is wet bag becuase I love the sweet pea brand and I was not disappointed! It holds plenty of diapers to get me through the day!